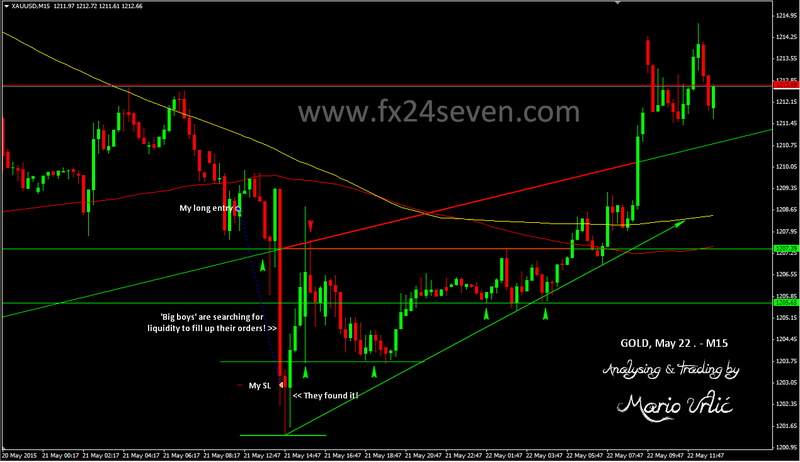 GOLD, my stop loss from yesterday! I didn’t show you my yesterday’s stop loss at gold, you know the reason why. Let me show you today, how and why that happend. As I wrote in my entry analysis, gold was well supported between 1206/08 yesterday with intention to go higher and to try attack on the Daily MA100 and 200, which was placed at 1211 and 1215. The gold was to quiet before US Jobless Claims data and after the data came out, it was obvious that the buyers will search for the liquidity lower, what exactly happend. I didn’t see this move down from 1210 to 1201, because all communicatios in my city were cut out exactly before that move. But, here is my analysis and explanation of this move today. This is not strange to me at all, these moves happens often in the market, it’s apsolutely normal. But, I will write more about my LIVE trading in the next article. There is something problematic here for me!